In September, K180 brought a team back to the Highlands of Scotland after being invited back by Elgin Community Church. Pastor Manuel had asked us to focus the weekend on reaching out to young people. We were able to do some prayer walking in the city after our arrival on Friday and have a look around the church’s new building which has recently been renovated. Saturday began with an evangelism training morning on how to share the Gospel with young people. After lunch and a short street evangelism briefing, a large group of us from the morning’s session headed to the streets. Though there were not many people stopping to listen to the music and preaching, the team had many Gospel conversations as a result of the outreach. Everyone who came out, many for the first time, left encouraged. After the outreach, we climbed Lady Hill again, overlooking the city, for a time of worship and prayer. Saturday evening was planned to be an evangelistic youth event, though owing to different factors, it didn’t happen in the way we thought it would. We had a blessed time instead praying for the youth ministry team which was coming together. On Sunday, the team shared during the church’s morning service and then made our way down to Aberdeen to share at the Tamil Congregation’s afternoon service, during which four people indicated first time commitments to Christ. It was exciting to see how God is raising up a youth ministry team at Elgin Community Church to begin to reach out to the young people of Elgin. We were able to pray for those who felt called to this, encourage and get alongside them as the weekend went on. We thank God for what He’s doing in Elgin, and look forward with anticipation at the new work the Lord will do among the unsaved youth of the city. Please pray for open doors for the Gospel in Elgin, even in the schools. The Edinburgh Fringe Festival takes over the Scottish Capital for pretty much the whole month of August every year. This summer, at the invitation of our friends at the Heralds Trust, based in Livingston, K180 brought a small team to labour alongside Robert Bell (leader of Heralds Trust) and some of his team in sharing the Gospel during the last week of the festival. We set up a daily ‘Street Cafe’ next to the Wellington Statue on Princes Street in the city centre, where we offered passersby a free hot drink (tea, coffee or hot chocolate) and asked them where they were at on their ‘spiritual journey’. Though there was some indifference, we found that almost everyone was willing to talk about spiritual things. Dozens of John’s Gospels were given out and many people received prayer. On the final afternoon, a Scottish man named S* approached the table. Despite his challenge of being homeless, a team member was able to share with him about the forgiveness and eternal peace found through faith in Jesus Christ. When asked if there was anything stopping him from saying ‘yes’ to Jesus, S* replied that there wasn’t and that he wanted to pray a prayer of commitment to the Lord there on the street. 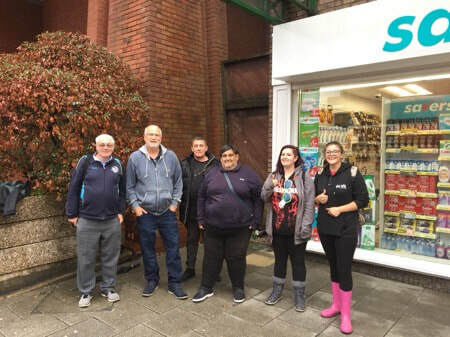 We were able to introduce him to Rob who, in turn, pointed him in the direction of some local city centre evangelical churches, some of which he was already familiar with. He left the Street Cafe table with his own copy of John’s Gospel. We also brought a collapsible ‘red step/stool’ with us that deputised well in the absence of a red box for an outreach on Princes Street on one of the evenings. The team were also able to receive teaching from the Heralds Trust team through mornings at their ‘Gospel Academy’, being refreshed in the area of Apologetics with Ian Leitch. It was a great week with the Heralds Trust team, with such a great opportunity to share the Gospel during the Festival. We are planning to bring a team up to Edinburgh again next summer. 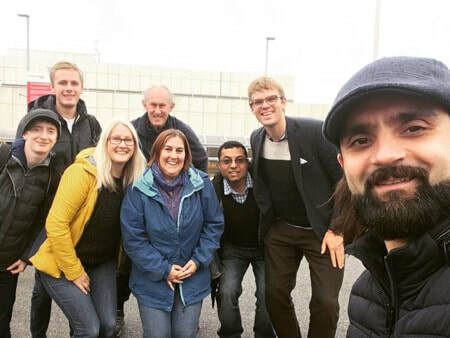 In September, we reconnected with our friend, and fellow evangelist, Martin Korchinsky and the church God led him to plant in the estate of Brinnington, Stockport for a weekend of training, encouragement and street preaching. We spent some time getting to know the church over pizza and prayer on Friday evening to hear what Jesus had already been up to in their lives and their community. Saturday morning was dedicated to testimony and illustrated message workshops with the team, and followed up by some practice on the streets. God quickly used us to draw a few people into conversation. Our teammates from the church were quick to engage the people of their town and step out faithfully to share their testimonies and messages. On Sunday morning, we were allowed the opportunity to share a word of encouragement with the Brinnington Community Church and enjoy some sweet time of worship and prayer together. Afterwards, we hit the streets for a little bit longer before the shops closed. Please pray for Martin, Angie, and the church as they faithfully continue to shine the light and hope of Jesus in Stockport! K180 sent a team of five (plus a little one) to St. Ives in Cornwall to serve on the larger United Beach Missions team for a week from 19-26 August. During the days, we were on the beach from about 11am-4pm, engaging with children and their families. Whether leading a beach football match, complete with half-time testimonies, or the afternoon ‘Beach Special’ children’s programme with engaging Bible stories and fun games, the Gospel was declared and shared in many ways. In the evening, we had the privilege of preaching the Gospel on the harbour slipway to those who were walking past. We were very thankful for the privilege of partnering with UBM in this mission week. Thank you to those who partnered with us in prayer as the team was ministering. In April 2017, K180 brought a team to Elgin in Scotland, to work with Elgin Community Church of God in evangelism training and street outreach. This was our first visit, having met the church’s pastor, Manuel, and his family whilst visiting the church his brother leads in Spain last summer. The team’s visit seemed to encourage the local believers in Elgin. There were even some who travelled from Church of God (CoG) congregations in Inverness and Nairn for the training and outreach on the Saturday. After the street outreach on Saturday afternoon, we walked up Lady Hill, the site of the ruins of Elgin Castle, where we could pray for the city as we looked out over it. On Sunday, the team ministered at the church in Elgin in the morning, and then we travelled to the CoG Inverness congregation in the evening. On the Sunday morning, we were delighted to see a man who was personally invited by one of the team during the street evangelism on Saturday afternoon, accompanied by his dog. The man is keen to come back again next Sunday. We hope the dog will come again too! We look forward to continuing our partnership with the church and to bringing a team again soon.